Share links and earn rewards! It sounds like a shady Internet get-rich-quick scheme. Or a way to spam your friends in exchange for pennies. There is a reason pay-per-tweet businesses geared at average Joes and Janes haven't quite taken off. But word-of-mouth marketing is so damn tempting to capitalize on, especially when social media allows us to track and attribute every successful recommendation. Someone just needs to do it well. That's the basic premise of Refer.ly, a startup launched today by Danielle Morrill, former head of marketing for Twilio, as well as Kevin Morrill, formerly of HelloFax, and Al Abut, formerly of AOL. Refer.ly will be a part of Y Combinator's Summer 2012 session, but unlike most YC companies that wait until Demo Day to unveil their product, Morrill has launched Refer.ly early. "We already have a product so we'd rather find out early if it's not a good idea," she says. The small idea is affiliate links. Social media users who share them get paid with rewards, charity donations, or cash. The big idea is "an Internet without ads." "We've seen the future of websites, and it's all beautiful sites that don't have ads but do have people who are ready to take action," Morrill says. I believe she is referring to Pinterest. 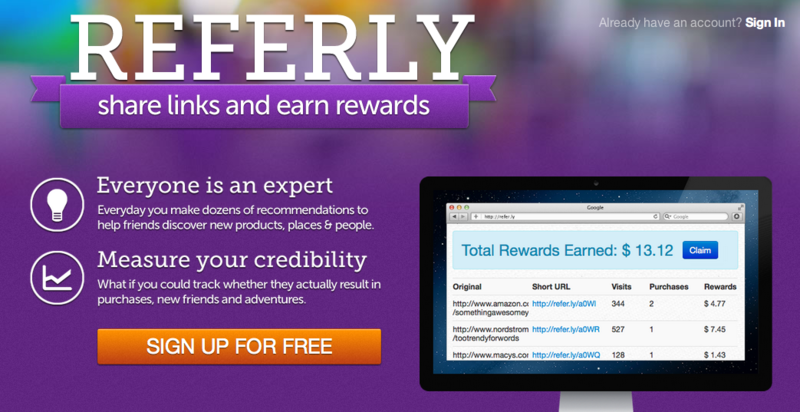 Refer.ly is referral marketing for Pinterest users, or Twitter users, or Facebook users. Where influencer measurement sites like Klout and Kred focus on the degree to which your followers react to what you're saying, Refer.ly focuses on how often they take action. Members get paid not when their friends or followers click on a link, but when they actually buy something. Thanks to cookies, last-click attribution for more considered purchases isn't a problem. If you share a link to a camera, and your friend buys it online, within 90 days of clicking on your link, you still get credit for that purchase, and you still get paid. There are a few hurdles here. For one, there's not much money to be made for users. The average non-Kardashian Twitter user doesn't have thousands of rabid fans just waiting to buy everything their friends tell them to. Those non-Kardiashians that do have followings didn't accumulate fans by spamming them. When they post spammy affiliate links, they might get a handful of click-throughs. An affiliate like MyLikes or Twittad might pay them a few pennies. That's why Refer.ly users can choose to donate their referral earnings to charity, take the money, or eventually, enter group reward contests like a one-in-one hundred chance at a laptop. Further on, the site will pay more than just pennies, because payments are based on real purchases and not clicks. For two, there is the awkward disclosure problem. Bloggers must mention, as regulated by the FTC, whether they are paid for affiliate links. Klout grapples with this in its Klout Perks program. If some Klout Perks winery sends you a bottle of wine because you have a high Klout score, your Tweets related to that bottle of wine must include a link to an unsavory "I WAS GIVEN A KLOUT PERK" disclosure on Klout's site. Are Pinterest pinners or Facebook status updaters subject to the same disclosure rules? Morrill says she hopes Refer.ly's brand will grow to the point where the "www.refer.ly/rewardexample" link will be enough of a signal for a paid referral. "People don't traditionally like affiliates, because it's kind of shady. We are going to blow that open entirely, because through this, we'll learn who is really credible," Morrill says. Similar to Bit.ly, Refer.ly users will be able to see how many clicks and purchases their links generate. The company has 30,000 brands in its network, thanks to deals Morrill has negotiated with affiliate networks and directly with vendors. Referral links can be created with a browser plug-in that's available once you're a member. Referl.y raised a seed round of funding from 500 Startups and Jeff Lawson, CEO of Twilio, who acts as an advisor to the company.